Oil Skimmers Inc. units continuously draw the oil-covered tubing up and out of the water, through the scrapers mechanism, and return the clean tubing to the water surface to gather more oil. The collected oils travel down a boom into an underground tank. Two Model 6V Brill™ floating collector tube skimming units are recovering $6000 worth of waste oil/year (144,000 lbs.) that previously had been discharged into the municipal sewage system. Eastern Foods, Inc., Atlanta, GA, processes a variety of products primarily for the foodservice industry – including salad dressings, tartar sauce, pancake syrup, cole slaw, and waffle batter. The oil-recovery units utilize a floating tube collection system. The closed-loop tubing is constructed of polyurethane – which attracts oil, but not water. 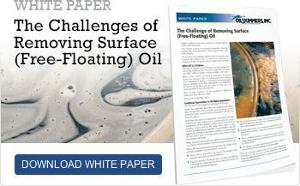 As the tubing slowly moves through the floating wastes in the pit, the oils adhere to it. The automatic skimming units continuously draw the oil-covered tubing up and out of the water, through the scraper mechanism, and return the clean tubing to the water surface to gather more oil. The closed-loop tubing has a circumference of 23 feet in this application, with 6-8 feet of tubing floating on the surface for increased pickup. The collected oils travel down a boom into an underground tank. The boom – which extends out about 8′ from the pit’s edge – can be maneuvered from side-to-side for maximum collection. In addition, the skimming units have been equipped with a heating element to keep the oil flowing in cold weather. From the underground tank, the collected oils are pumped to an above ground tank – where solar heating separates the lighter oils from the heavier ones. These lighter oils are then sold to an oil reclamation plant – earning Eastern Food approximately $6,000/year.